I think this would be even more fun..
And they are even in IKE colors! Babbman wrote: I think this would be even more fun..
And then the team name would be something like Devolutionaries. 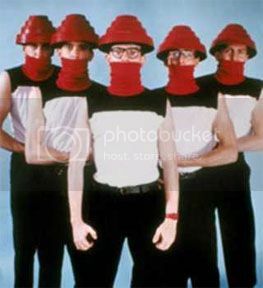 Except that Disney is now selling a new band, Devo 2.0, with kids playing the old Devo songs. That takes the fun out of it. The really scary part with the army picture, is the lead guy looks a little TOO much like me. I can see some resemblance. Maybe we need a photo of you in your 20's. You know, back when photos were only in black and white and they had those exploding flash bulbs. As long as we have strayed off-topic, here's a couple more balloon photos. Rose taught a 4-day balloon twisting class at her high school for a few years. Mike wrote: I can see some resemblance. Maybe we need a photo of you in your 20's. Our baby cots were covered with brightly coloured lead-based paint which was promptly chewed and licked. We had no childproof lids on medicine bottles, or latches on doors or cabinets and it was fine to play with pans. When we rode our bikes, we wore no helmets, just flip flops and fluorescent 'clackers' on our wheels. As children, we would ride in cars with no seat belts or airbags riding in the passenger seat was a treat. We drank water from the garden hose and not from a bottle and it tasted the same. We ate chips, bread and butter pudding and drank fizzy pop with sugar in it, but we were never overweight because we were always outside playing. We would leave home in the morning and could play all day, as long as we were back before it got dark. No one was able to reach us and no one minded. We did not have Play stations or X-Boxes, no video games at all. No 99 channels on TV, no videotape movies, no surround sound, no mobile phones, no personal computers and no Internet chat rooms. We had friends we went outside and found them. We fell out of trees, got cut and broke bones but there were no lawsuits. We had full on fistfights but no prosecution followed from other parents. We played knock-down-ginger and were afraid of the owners catching us. We made up games with sticks and tennis balls. The idea of a parent bailing us out if we broke a law was unheard of. They actually sided with the law. This generation has produced some of the best risk-takers and problem solvers and inventors, ever. The past 50 years have been an explosion of innovation and new ideas. And you're one of them. Congratulations! They have never heard of We are the World, We are the children, and the Uptown Girl they know is by Westlife not Billy Joel. They have never heard of Rick Astley, Bananarama, Nena or Belinda Carlisle. For them, there has always been only one Germany and one Vietnam. AIDS has existed since they were born. CD's have existed since they were born. Michael Jackson has always been white. To them John Travolta has always been round in shape and they can't imagine how this fat guy could be a god of dance. They believe that Charlie's Angels and Mission Impossible are films from the last few years. They can never imagine life before computers. They'll never have pretended to be the A Team, Red Hand Gang or the Famous Five. They'll never have applied to be on Jim'll Fix It or Why Don't You. They can't believe a black and white television ever existed and don't even know how to switch on a TV without a remote control. And they will never understand how we could leave the house without a mobile phone. 1. You understand what was written above and you smile. 2. You need to sleep more, usually until the afternoon, after a night out. 3. Your friends are getting married/already married. 4. You are always surprised to see small children playing comfortably with computers. 5. When you see teenagers with mobile phones, you shake your head. 6. You remember watching Dirty Den in EastEnders the first time around. 7. You meet your friends from time to time, talking about the good old days, repeating again all the funny stories you have experienced together.